ADT Home Security Systems Monitoring and Wireless Home Alarm Burglary, Fire, and Medical Protection from Apex Direct Canada. Servicing – Ontario, Alberta, B.C., Manitoba, and Quebec. ADT Monitored Home Security Systems – ADT Wireless and Wired Home Alarm Systems and burglary monitoring help protect your home and loved ones with a free home security system from Apex Direct Canada, your local ADT security dealer. Installing a home security alarm could be the most important decision you make to help protect your family and home. Most burglars are opportunity offenders and they will avoid homes that are protected with a home security system from ADT. Call Today 1-888-496-9488 for a Free Estimate. With a monitored smoke detector, ADT is alerted immediately and can contacts the fire department, whether you are home or away, helping to protect your loved ones and minimize property loss. ADT’s superior monitoring capabilities clearly sets them apart from any other security system or company. A single ADT monitored system connected to an ADT Customer Monitoring Center. I’m very pleased with the system. The tech was quick and clean with the installation, and we had clear communication about where to place the sensors. He was also patient when explaining the system and how easy it is to use. Your fees are very reasonable, considering the feeling of safety and piece of mind knowing my property is secure. I’m almost excited about expanding my system once I build my shop. Servicing – Ontario, Alberta, B.C., Manitoba, & Quebec. Help protect your home and loved ones with a free home security system from Apex Direct Canada, your local ADT security dealer. Installing a home security alarm could be the most important decision you make to help protect your family and home. Most burglars are opportunity offenders and they will avoid homes that are protected with a home security system from ADT. Our standard wireless security system connects your home to a network of Canadian and North American monitoring centres that help protect your home from burglary, fire and medical emergencies 24/7, 365 days a year. Cellular monitoring. No landline, no problem. CellGuard® enables your wireless home alarm to communicate with our central monitoring station without a home phone line. Optional two-way voice intercom system allows you to talk with the ADT monitoring centre in the event of an intrusion or medical emergency. Home automation with voice control. Enjoy the benefits of controlling your alarm, lights, appliances, thermostat and door locks from a tablet or smartphone. Remote alarm access and control. Now you can access and control your ADT alarm from your smartphone, tablet or computer. Stay connected more than every before with text and email notifications of alarm events. Video surveillance with 24 hour-a-day motion activated email and text alerts. Keep an eye on your home while you are away and receive automatic text and email alerts with video footage of captured events. 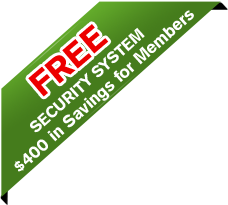 FREE* ADT Monitored Home Security System with 6 month money back guarantee. Apex Direct is a local ADT Authorized Dealer servicing Ontario, British Columbia, Alberta, Manitoba and Quebec since 2001. We have also been a proud CAA Affinity Partner for the past 6 years http://www.apexdirect.ca/caa and a Better Business Bureau member with A+ Rating with over 10,000 security systems installed. Your family’s safety is important. Don’t settle for anything less than the best business and home security alarm service. We offer high quality alarms with second to none service. You can trust ADT monitoring services, the industry’s top rated home security service provider. Burglary and crime are a daily part of the news throughout Canada. Proactive Canadian home and business owners turn to ADT Security services to help provide protection and peace of mind. ADT is the largest home security monitoring company in world and has been in the security business since 1874. ADT helps secure 80% of the fortune 1000 businesses in North America and over 800,000 homes in Canada. (ADT’s monitoring center agents go through a comprehensive training program before being certified by ADT and are independently recognized as the best critical systems support providers in the industry). Your ADT monitored security system is connected to ADT’s Customer Monitoring Centers. ADT monitors your home 24 hours a day, 7 days a week, 365 days a year. Our monitored smoke detectors and medical emergency services utilize “Always On” devices even when your burglar alarm is not armed. When an alarm is triggered, ADT can alert the police, fire department or an ambulance even if you’re not home.